A loan of $10,000 helped to supply baking ingredients, coffee beans, chocolate, compostable packaging, and working capital. Melanie Diamond-Manlusoc, co-founder of Flow State CoffeeBar, holds a Bachelor of Music Education from Michigan State University and an Associates of Applied Sciences of Patisserie and Baking from Le Cordon Bleu College of Culinary Arts, Chicago. While she was studying classical saxophone at MSU, she took a trip to northern Italy for a saxophone festival. There she fell in love with the rich, custard-based gelati of Emilia Romagna. Splash, Starchefs.com, WCIU-TV Chicago, and numerous local, national, and international food blogs. Melanie's characteristic tenacity is evident beyond the accolades she has racked up. After visiting Philly and witnessing its vibrant food scene, she decided then that this was where the venture needed to happen, sparking the entrepreneurial journey currently underway. After 18 months of planning, fundraising, and marketing for the venture, Melanie left her high profile position in Chicago, sold the condo she and Liz owned, and they moved to Philly in November of 2016 to begin the next chapter. Since then, it's been all Flow State all the time! It helps a female entrepreneur fund her working capital needs to expand her cafe, which provides a unique space for her local community. Flow State CoffeeBar is a multi-angle solution to the cafe conundrum for telecommuters, who frequent cafes in hopes to snag coffee, free wifi, AND a table if luck has it. Co-working spaces are designed with work-related amenities in mind but don't offer a food menu. Few food and drink spots are designed to be the perfect telecommuter's haven. We envision Flow State to be a perfect marriage of cafe and co-working space that inspires creativity and productivity by serving up freshly made food, the perfect cup of coffee, and an inviting environment. Co-working amenities include reservable tables, ample outlets, and secure, high-speed wi-fi. Every customer coming through our doors will discover the thing that keeps them returning. It might be that convenient cup of well-made coffee before starting the day or one of Melanie's obsessively crafted pastries or gelati. We have enjoyed getting to know our neighbors and friends in the River Wards, and we will continue to do that by hosting fun culinary events and collaborations with those who are equally curious about us and the world all around. We have plans to grow our humble coffee shop into a lively locale for the night birds to meet with friends over a beer or three. Our biggest challenge has been getting funded as a new business. Lenders want businesses to be established before they will consider a loan. As a new business with new ideas, banks do not consider us or our potential. It has been due to community-focused organizations such as Kiva and the NKCDC that we have been able to start with literally nothing but our ideas, our friends and family, and to have arrived where we are now-- with a finished space full of coffee and baking equipment ready to go. - coffee from local roaster Square One, - ingredients for Melanie's delicious pastries, cookies, and gelati, - eco-friendly takeout-ware like compostable plastic cups, bowls, and utensils, - electricity and gas to keep the lights on and the ovens hot. While we do our best to deliver food, drinks, and a vibe that will grow our customer base, this loan can bridge the financial gaps that every new business experiences, and that, certainly, we will experience. Why are you endorsing Melanie? 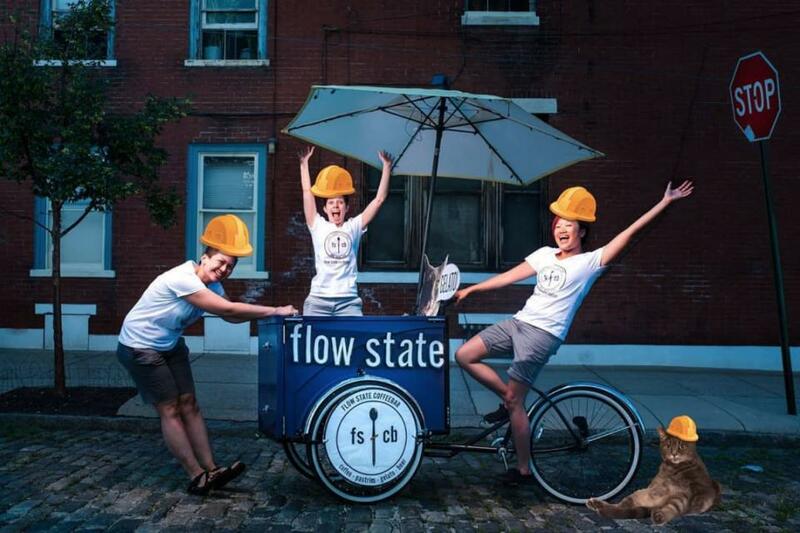 We are very excited to welcome Flow State Coffee Bar into the neighborhood. Maggie and her team have been very involved in community events since they began pursuing this business concept. They are committed to offering needed products and services to the neighborhood through a unique business model. Not only are their desserts delicious but their business model brings something new to the neighborhood. What is most inspiring about Flow State Coffee Bar, is the passion each person brings to the team. Flow State Coffee Bar has all the ingredients to be a successful business and community hub.